President Mahinda Rajapaksa will be the Chairman of Commonwealth for the following two years, said External Affairs Minister Prof. G. L. Peiris yesterday at press conference dealing with the Commonwealth Heads of Governments Meeting(CHOGM), held at the External Affairs Ministry auditorium. 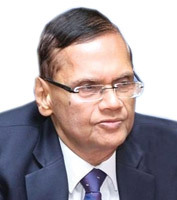 Prof. Peiris said, this is a major victory by the country against its detractors, who have been trying to prevent Sri Lanka playing host to this all important biennial summit meeting. He said , hosting of CHOGM provides ample opportunities for Sri Lanka to show the world where it stands as a country after defeating terrorism, what are Sri Lanka's post-war achievements in terms of development, resettlement, national reconciliation , economic stability and political tranquility. He said, this will be a big blow to the credibility of those misinformation campaigners that have been trying to bring the country into disrepute by using various human rights allegations as their principal weapon. 'These elements have been working to prevent the flow of foreign investments and tourists to the country through these campaigns aiming to thwart the progress of the country's development after the war," he said. "CHOGM is going to change all of that," the minister said. The summit will be held in the country on November 15 to 17. High profile leaders of Commonwealth countries have informed External Affairs Ministry that they will participate the summit in November. Meanwhile, President Mahinda Rajapaksa has called on the country to treat Commonwealth summit as an event of the country, and not as an event of the government. Youth Affairs and Skills Minister Dullas Alahapperuma said at the press conference , that he had seen some articles written by some individuals, with an aim to indicate a connection between the 13 th Amendment and the Commonwealth summit. There is indeed no connection between the two although they have tried to invent such a connection to politicize it . "Commonwealth summit is an achievement of the country, it is not an achievement by a political party," he pointed out.